One of the challenges when you start looking for a business coach is that with so many different types, it is hard to figure out which is best for your business. 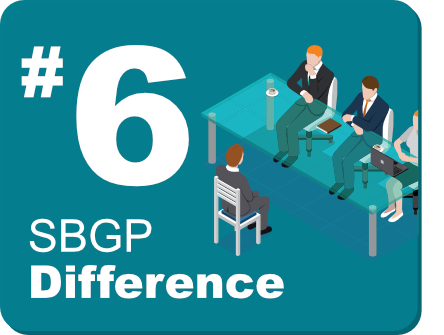 Here are six things that make SBGP different. What this means is that we have full control over the coaching process, and our employee coaches. You don’t have to worry about “questionable” coaches working with you or your Company who are not of the highest caliber. 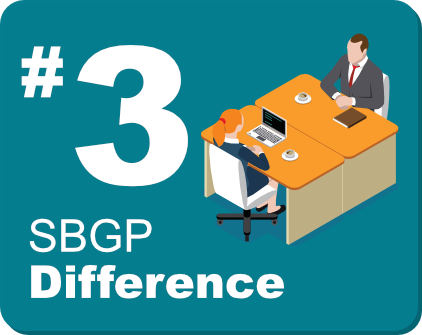 All our coaches are selected from former business owners and upper level corporate executives who already have business coaching experience prior to coming to SBGP. The consideration for candidacy in one of our programs, including the creation of a personalized Business Diagnostic & Plan of Action is not available to the general public. 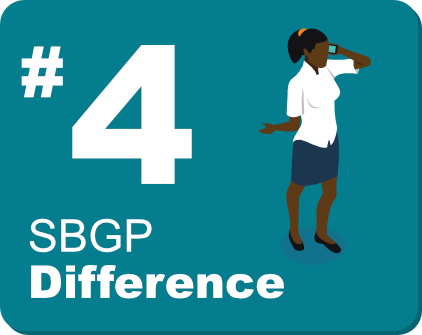 Eligibility is reserved solely for current Strategic Alliance Partner clients and customers, a direct SBGP client referral, or through a state Pilot Program. This exclusivity allows us the opportunity to create detailed, comprehensive, and high-impact plans for small business owners that meet the client criteria of both our Strategic Alliances and SBGP. Our competition primarily focuses on recruiting franchisees or licensees to generate the bulk of their income and client results then become secondary; our model is the exact opposite. 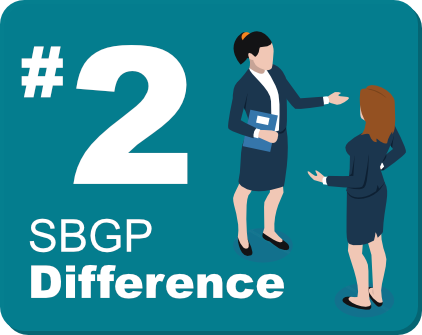 SBGP is the only small business coaching company that employs a true “two-tiered” business model. What this means for you is that our coaches only coach, and they don’t have to worry about constantly going out to find new business owners as their clients. 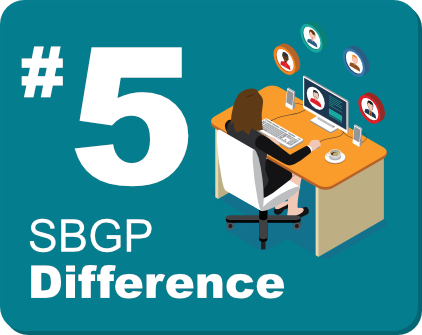 This gives SBGP the ability to employ coaches that have a long and successful track record of consistently improving business owner’s company operating results. Other business coaching firms may boast that they have a dedicated main franchise or licensee office to support their coaches, but that just doesn’t deliver the results needed by small business owners. 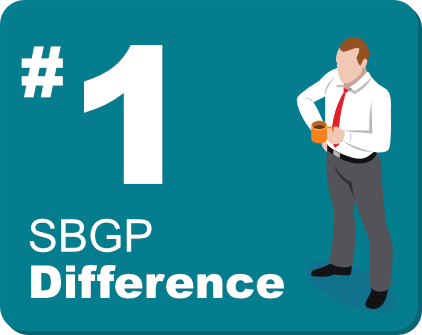 SBGP is the World’s most effective 100% employee-based, fully private and National small business coaching firm. What this means for our clients is that they have a primary coach, who can ask for added assistance from our team of industry experts in all aspects of business to advise them even further on industry specifics. This greatly assists both the coach and client, and we are the only business coaching firm whom implements this unique process and structure. If you look at a traditional coaching firm, they have the ability to attract clients from a 15 to 20 mile radius from their offices. This also means that their coaches must live in the local area for face-to-face meetings with business owners. In our model, we are able to employ coaches from all across the USA, giving us an extreme advantage in the quality of SBGP coaches. This equates to much higher coach skill sets and significantly improved results for our clients. Our coaching platform is 100% integrated with our internet driven video conferencing system, cloud based document and template silos, and client tracking system to provide a leveraged and seamless coaching experience. This saves business owners their most precious asset – time; this also shortens the time in which they can see tangible results. Since we do not have franchise or licensee coaches, we have created our extensive training materials “from scratch” and improve our extensive database of strategies and templates created from coaching our clients. This application database is industry specific and gives us invaluable information on how to help our clients best, no matter the industry. Find out how we can provide you with a detailed and comprehensive analysis of your business, including an internal website and online review of your company.